What happens when you ride every greenway in Seattle? Over the course of several weeks, I did exactly that and came away with a deeper understanding of how far we have come…and what the Seattle Department of Transportation (SDOT) needs to do to realize the full potential of greenways. First of all, I didn’t just ride every greenway. I rode them, I walked them, and in some cases I drove them. I went from one end to the other and back again. I observed every sign, every speed hump, every pavement marking, and every piece of physical infrastructure, and I took notes along the way. I took my wife and 11 year old son along for the ride and recorded their impressions, as well. What did I find? First of all, it’s clear SDOT knows how to build greenways now. After a rough start that gave us the Wallingford Greenway — an embarrassment by any measure — SDOT is building greenways roughly on par with current practice in other cities. Early on, it seemed like Seattle was going to fully recapitulate Portland’s entire painful evolutionary process. Instead of simply picking up where Portland left off, SDOT apparently needed to re-live their mistakes. It was maddening to those of us who understood how greenways work. Fortunately, though, we’re past that and we have nothing but love for our friends at SDOT. Bygones. That doesn’t mean we don’t still have things to learn here in Seattle. So here are three lessons for SDOT that become readily apparent when you ride every greenway. Many greenways pass alongside beautiful parks seemingly oblivious to their proximity. No curb cuts, no park entrances welcoming people along the greenway. 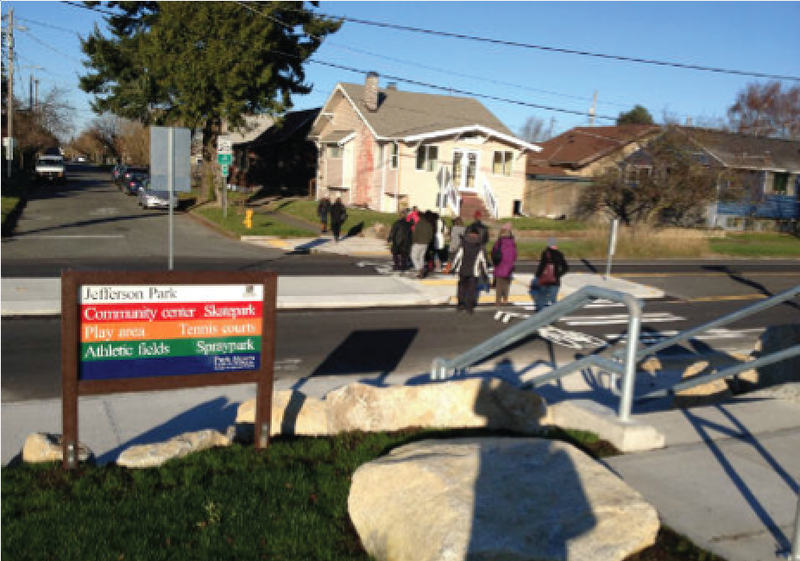 A greenway has the potential to link and extend the reach of Seattle’s park system. A park should be an extension of the greenway network and vice versa. Similarly, many greenways pass through creek protection and Combined Sewer Overflow (CSO) reduction opportunity areas without addressing green stormwater infrastructure. SDOT needs to do a much better job collaborating with Seattle Parks & Recreation and Seattle Public Utilities to truly green our greenways. The portal from the Beacon Hill greenway to Jefferson Park (shown above) is a rare and welcome exception. It needs to become the rule. The offset arterial crossing at 32nd Avenue NW along the Ballard Greenway forces cyclists to merge into a standard 5’ bike lane at a 90 degree angle. It may look fine on a schematic but, as a user, it’s puzzling. There are numerous instances of 20 mph signs placed right at the corner of an arterial entrance to a greenway. Motorists focused on making the turn will likely pass the sign unnoticed. At various locations, you will see pedestrian half-signals installed without beg buttons accessible to cyclists or beg buttons located on the left side of the street only. I witnessed a woman on a cargo bike fully loaded with groceries struggle awkwardly to activate one of these signals. It wasn’t pretty. Do we make drivers park and get out of their cars to activate signals? We do not. We seem to like diverters made from paint instead of concrete. A diverter is intended to prevent motor vehicles from turning onto a greenway. It is possible SDOT is focused on compliance rates but there is a big difference in the perception of safety provided by an actual physical concrete curb versus a painted (and soon to be faded) indicator. The Andover “raised crosswalk” on the Delridge Greenway is intended to protect pedestrians in the crosswalk but the raised portion is barely perceptible. If we truly want to protect vulnerable users, we can learn a lesson from certain mall parking lots and give people a real raised sidewalk. Arterial crossings along greenways seem to have the minimum acceptable treatment. Ride the Ballard Greenway and you will wish the crossing at 14th was as good as the one at 32nd. Similarly, you will wish the crossing at 32nd was as good as the one at 24th and you will wish the crossing at 24th was as good as the one at 15th. Just once, let’s make err on the side of favoring pedestrians. In spite of these gentle observations, SDOT’s trajectory is, without a doubt, solidly upward. Quality is improving and the results are readily apparent. These essential greenway corridors, currently scattered across the city, are gradually coalescing into a linked network promising greater safety for those who choose to travel under their own power. As we continue to work with SDOT, Seattle Neighborhood Greenways is dedicated to making this network a reality, one that sets a standard for quality that other cities will strive to match.